I joined you on your Tuscan trip in Sept, 2002 with my friend Pat. I am thinking about Morocco for my next culinary and cultural adventure, but I’m concerned about the political unrest in Tunisia, Egypt and that region in general. What are your thoughts? Nice to hear from you. I can assure you that I feel absolutely safe traveling to Morocco, and bringing guests with me, in the coming months.I am reminded of the time that I spent time in Morocco on 9/11 and the months and years just after. As an American traveling at that time, I received much heart-warming support from the Moroccan people, both close friends and strangers. What I have to say about the current political climate in North Africa is rooted in my comfort with the Moroccan culture, and from the views and opinions of many of the my contacts there, who vary in background and experience.The government in Morocco is different form that of Egypt and other North African countries in that it is a monarchy, not a dictatorship, with a young and progressive King. He has done a lot to increase the welfare of his people and, in general, they love and respect him. Morocco also began to institute political reform some years ago. Morocco is also separated geographically from the Middle East–in many ways, it is more an extension of Europe. I feel that what is happening in Egypt is astoundingly positive for the Arab nation. The youth of that region are changing the old mentality–something that influence from the West cannot accomplish on its own. If you have any other specific questions, please do let us know. We would love to have you join us! 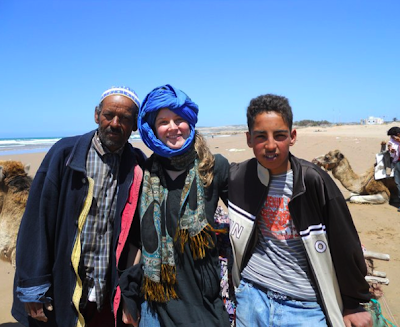 Our booking coordinator, Merete, moments after a lesson in “How to Wrap a Turban” from two experts on the beach in Essouairia, during our Spring 2010 program. Don’t miss out on any of Peggy Markel’s upcoming Culinary Adventures and Slow Food Tours. Click here to learn more!